Featuring spectacular slope side views in both Vail and Beaver Creek, Vail and Beaver Creek Chophouse sit amidst all of the seasonal action and beauty! 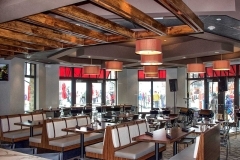 Our extensive lunch and dinner menus are filled with great steaks and fresh seafood. With our spacious, mountainside decks and evenings filled with live music and magic, there’s no better place to enjoy the mountains! Weddings come with a lot of tradition, but perhaps you’d like to wear your wedding dress in a creative and fresh new way. Trashing the dress is a trending activity to do with your guests after the big day. Let your guests help redesign your classic white dress in a game of paintball with Nova Guides. Play guys against girls or exercise your new marital status and team up with your new hubby. 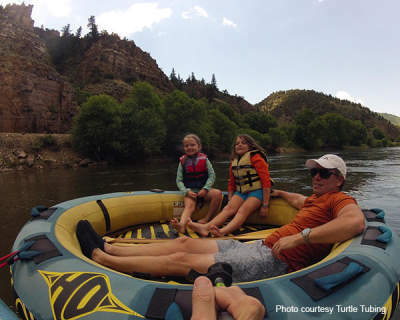 If you’re looking for a more laid-back approach to trashing your dress, try tubing down the Colorado River with Turtle Tubing. Grab your guests and toast to your Happily Ever After in multi-person tubes that allow you to relax and unwind after your exciting wedding day. 4 Eagle Ranch is open year round and is one of Colorado’s premier wedding destinations. Located just 25 minutes west of Vail, they can accommodate up to 550 people in their wedding and event venues. With our historic Nelson Cabin, magnificent Event Center and wedding pavilion with views of the Sawatch Mountain Range that will take your breath away, it’s easy to understand why guests from all over the world come to 4 Eagle Ranch to tie the knot. Piney River Ranch offers the quintessential backdrop for your nuptials. Their Wedding Deck reaches out over the shimmering waters of Piney Lake at the base of the striking Gore Mountain Range, the perfect vista for a truly memorable event. After the ceremony, imagine your guests enjoying canoeing, hiking and fishing. West Vail Liquor Mart has the best pricing and largest selection of beverages in the Vail Valley. It offers a huge assortment of wine, beer, and spirits, plus a variety of soft drinks, mixers, juices, glassware, corkscrews, and gifts and accessories. From 2 to 500 guests, the knowledgeable staff can help you plan the drink menu for your special event. Ride the gondola together right after you say, “I Do”. You’ll enjoy stunning scenery as you spend some quiet quality time with your new spouse. Don’t forget to have your photographer follow you up to get an iconic photograph that will stir up treasured memories. Caffeine and alcohol intake at altitude help lead to dehydration. Be sure to drink plenty of water and remind your guests to hydrate during their stay.